I love finding new ministers to follow who have not fallen into the trap of the "new" religion - whatever that is! I believe all these new evangelicals are dangerous as I consider them to be "false prophets" - teaching by taking the words of scripture and using them for personal gain. Christ hated the "money changers" and I am sure there is a roar in heaven over Chrislam and Coexist. In Coexist the very idea that my God would ever ask someone to murder another human being just because they don't believe in Him is outrageous. Muslims and Christians DO NOT worship the same God no matter what kind of spin they put to their reasonings - I have read the Koran. They should read the Bible the way it was written. Michael Gorbachev, Al Gore, & Bush Family along with Progressives all over the world are the driving force behind a new age pagan religion known as Gaia through Global Warming and the Education system. It is pure nature worship. Strong though in China which owns a 63 thousand acre ranch in Colorado called Baca Grande that will never be bothered by the Forest Service or the Army Corp of Engineers. Because Baca Grande is the Mecca for Gaia worshippers and mystics. Here, Strong has built a temple to a Babylonian Sun God. OR COULD IT BE CHRISLAM - Rick Warren's movement to join Christianity and Islam into one religion claiming they worship the same God. Watch and listen to the video that shows the humble beginnings of how Chrislam began. This is a 23 minute clip from his speech at the 2009 ISNA convention, in the which you will hear him discuss nuggets like the importance of globalization, how Christians and Muslims need to "lay down their differences" and work together, and so much more. Deeply humbled and honored? Rick Warren, in his own words, has no problem with the concept and doctrine of Chrislam, he just doesn't want his own name attached to it. Listen to the words and hear the self serving ego that comes from his mouth! March 2014, Anglican priest Tony Palmer, a member of the Roman Catholic Ecumenical Delegation for Christian Unity and Reconciliation, gave a rousing call to Kenneth Copeland’s church to “return to Mother Rome”. He was met with a hero’s welcome by a very enthusiastic congregation. And just in case you thought that it was a “one off” meeting, you would be sadly mistaken. Kenneth Copeland Is Selling His Flock To The Vatican from Now The End Begins on Vimeo. Flash forward to the meeting in Vatican City, Rome, and who do we see meeting around the table? 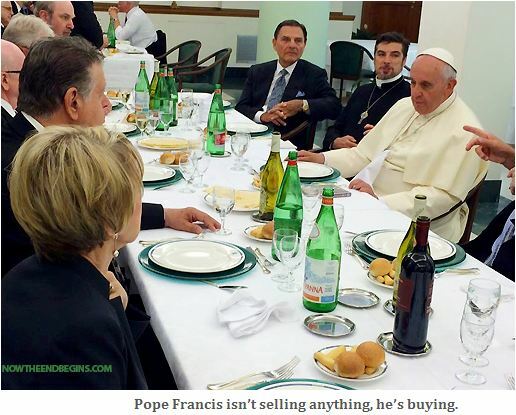 Why, it looks like charismatic leader Kenneth Copeland, Roman Catholic priest Tony Palmer, and assorted others from the Charismatic movement in Toronto breaking bread with Pope Francis. And just in case you forgot Tony Palmer’s original message, here is a refresher for you: the video above. Just what is it - the Fluoride they've been putting in the water all these years that we now have a whole culture of SHEEPLE? Is no one awake? Snake charmers are getting rich! Scientists Prove There Is A God Through Science and Nature! On Friday, February 1, 2013, on the basis of evidence supplied by our affiliated Common Law Court of Justice (itccs.org), our Office concluded an agreement with representatives of a European nation and its courts to secure an arrest warrant against Joseph Ratzinger, aka Pope Benedict, for crimes against humanity and ordering a criminal conspiracy. This arrest warrant was to be delivered to the office of the "Holy See" in Rome on Friday, February 15, 2013. It allowed the nation in question to detain Ratzinger as a suspect in a crime if he entered its sovereign territory. A diplomatic note was issued by the said nation's government to the Vatican's Secretary of State, Cardinal Tarcisio Bertone, on Monday, February 4, 2013, informing Bertone of the impending arrest warrant and inviting his office to comply. No reply to this note was received from Cardinal Bertone or his office; but six days later, Pope Benedict resigned. The agreement between our Tribunal and the said nation included a second provision to issue a commercial lien through that nation's courts against the property and wealth of the Roman Catholic church commencing on Easter Sunday, March 31, 2013. This lien was to be accompanied by a public and global "Easter Reclamation Campaign" whereby Catholic church property was to be occupied and claimed by citizens as public assets forfeited under international law and the Rome Statute of the International Criminal Court.